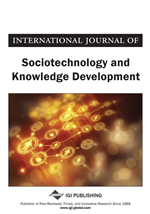 This paper contributes to the field of knowledge management arguing that knowledge management research should be grounded in both systems thinking and sociotechnical thinking. Systems thinking enables the treating of knowledge management broadly, as a complex system, not limited to knowledge management processes, but encompassing other essential elements related to managing knowledge at an organization. Sociotechnical thinking considers both social elements and technology equally important in managing knowledge. The two above mentioned approaches are used to support the idea that, in order to successfully manage knowledge, a balanced sociotechnical knowledge management system should be designed at an organization. The article seeks to investigate the main elements of such a system and to show how these elements relate to each other demonstrating that a strong correlation exists between the knowledge management process and strategic leadership. Knowledge management, as a fast growing field, has been attracting the attention of many researchers, consultants, and practitioners. The number of books, research articles, and forum discussions about knowledge management is increasing every day and the interest in this topic is getting stronger and more active. A rising attention to this field provokes researchers to develop knowledge management theory and research methodology. To address these needs, new ideas and models are being proposed, concepts analyzed, new hypotheses formulated, research data presented and interpreted, and important contributions towards understanding the management of knowledge are being made. However, at this point, a theoretical and methodological base of knowledge management has not been yet well-established. Therefore, a strong theoretical and methodological foundation is still needed for better understanding the essence of the phenomenon and for establishing a well-grounded knowledge management discipline which offers theoretical perspectives and valuable practical insights. The paper aids the researchers who seek to understand the complexity of knowledge management by underlying the idea that knowledge management is effective only when an adequate knowledge management system (KMS) is developed at an organization. A knowledge management system is rather a new object of research and development, especially in its broad sense. Narrowly, the term “a knowledge management system” is used in literature as a synonym for an information technology based system, applied to managing organizational knowledge (Alavi, 2001). KMSs, from this point of view, are associated with information systems, and many of the tools and techniques of knowledge management are related to information systems (King, 2009). In general, when researchers discuss such KMSs, they refer to the intranet, databases, groupware, search engines, e-mail, decision support systems, expert systems, document management systems, etc. This paper, however, is focused not on the technology side in developing a KMS. The definition of a KMS, used in this article, has been based on the analogy with a complex system. According to Simon (1962), a complex system is the one that consists of many unique and interacting elements, which have equally important effects on the outcomes produced by the system. In such systems, the whole is more than the sum of the parts. Thus, the behavior of such a system could not be understood by a detailed analysis of some particular elements. The investigation of the whole system behavior is needed. In the case of knowledge management, this means that a detailed analysis of separate aspects of knowledge management (for example, separate knowledge management processes, information systems used to maintain the flows of information and knowledge at an organization, processes of organizational learning, etc.) could not let us understand the whole system. Thus, a broad knowledge management context should be analyzed. Adopting this perspective, a KMS is treated as a complex system which includes interacting elements. These elements are both social and technical; and they are equally important for effectively managing organizational knowledge. Thus, the cornerstone of this article is the recognition that both systems thinking and sociotechnical thinking should be used as a basis for analyzing and developing a KMS. A number of models of sociotechnical KMS have been discussed earlier in literature (Coakes, 2002; Handzic, 2011; Meso & Smith, 2000; Okunoye & Bertaux, 2006; Pan & Scarbrough, 1998, 1999). Yet, there is no generally accepted structure of such a model. Some of these models propose similar elements, other elements are different. After a detailed analysis of the existing models, some essential limitations could be identified. The main limitation of the existing models is their major focus mostly on the context that maintains successful knowledge management. However, these models do not show how this context relates to the knowledge management processes. Moreover, the relationship between the structural elements of a KMS is not broadly discussed in the context of the existing models. Recognizing this gap, current paper not only presents the elements of a conceptual KMS, but also explains how these elements interact.